Map showing location of Kakadu: Map of the Northern Territory North West. Covering 19,804 square kilometres, Kakadu NP is regarded as one of the most beautiful parks in the world. This region has always been important to Aboriginals, rock art galleries have been found here dating back fifty thousand years. Crocodiles rule the waters of Kakadu. It is therefore important to observe safety signs, but you can view them at a distance at different places in the park, including Cahill’s Crossing in the east or taking one of the Aboriginal cruises available. You can spot any and more of the amazing and abundant birdlife that Kakadu has, it has a third of Australia’s bird species living or migrating through the park in their season. Rare white bellied sea eagles, brolgas, jabirus and many others make this a bird watcher’s paradise. 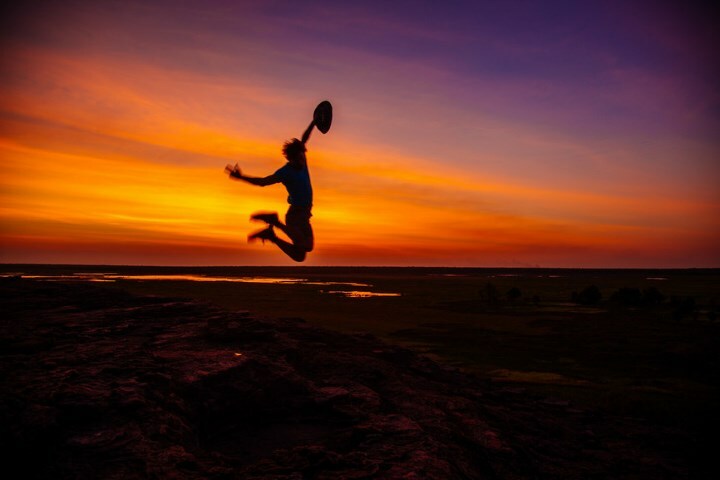 The Aboriginal connection to the Kakadu region goes back many thousands of years, with two traditional owner groups, the Bininj people in the north and the Mungguy people to the south. One great way to find out more about the history, culture and the park itself is to take one of the Aboriginal tours on offer. Its fun learning about the many bush foods available, the stories, the arts, music and the many native animals and birds that live here from a local. You can take one of tours or cruises available. You can even explore this vast park from the air, either by plane or helicopter, available from Darwin. Despite the warm weather, swimming is not advisable in the many waterways except for the public pool located in Jabiru. If your lucky, you may be staying at accommodation in the park with a pool on one of those hot days. Near Jabiru: Bowali Visitor Centre Phone: +61 8 8938 1120 or near Cooinda, the Warradjan Aboriginal Cultural Centre: Phone +61 8 8979 0145. The Darwin Visitors Information Centre: Phone: 1300 138 886 or + 61 8 8980 6000 is also very helpful about Kakadu and the other parks in the region. Before visiting Kakadu, it is important to find out about the condition of the roads as rains and other seasonal effects can make it difficult. The Arnhem Highway is the main route to the park (allow about 3 hours) from Darwin Australia. The Stuart Highway can take you further south, where you can access the park from Pine Creek.